Xenia Christian’s Grace Norman (12) runs the 1,600 during the Division-III state track meet, Saturday at Ohio State’s Jesse Owens Memorial Stadium. Carroll junior Christina Kallet (15) runs in the Division-II 800 race at state competition, Saturday at Ohio State’s Jesse Owens Memorial Stadium. Xenia Christian sophomore Rachel Sweeney runs in the Division-III 800 race at state competition, Saturday at Ohio State’s Jesse Owens Memorial Stadium. 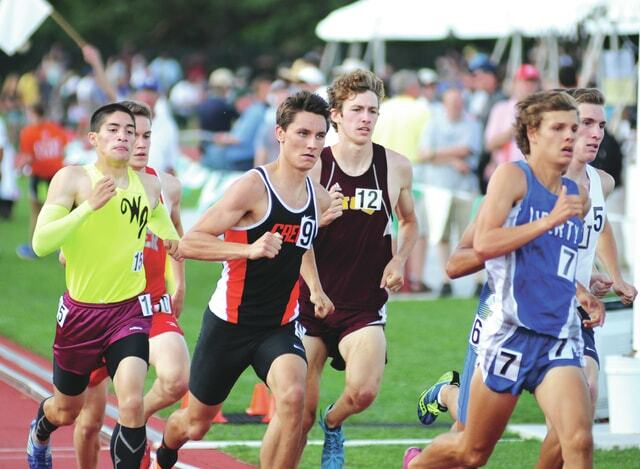 Beavercreek senior Tristan Tapia runs in the boys Division-I 800 race at the state tournament, Saturday at Jesse Owens Memorial Stadium. COLUMBUS — Day-two of state track Saturday at Jesse Owens Memorial Stadium was for the young guns. Of the seven Greene County athletes competing at the state meet Saturday, only three were seniors. The other four hoped to learn skills to help in their future. Grace Norman, a Xenia Christian junior, made the podium in the 1,600-meter race in her first experience at state. She started off the race slower near the end of the pack but slowly crept up to finish in the eighth spot with a time of 5:14.09, which she said is a personal record. Norman was in ninth place coming down the final turn and gutted out one last burst of speed to secure the eighth spot. According to the US Paralympic Track & Field Committee, Norman is the first ever high school athlete to podium in a state track meet in the US as an amputee. Norman said she was just happy to compete. Rachel Sweeney, a Xenia Christian sophomore, had one of the faster times in qualifiers for the Division-III 800 run. While she didn’t make the podium in the final, she said that she learned some valuable lessons going forward. Carroll junior Christina Kallet was also making her first appearance at state competition in the Division-II 800. “I honestly wasn’t how I was ranked, but I just knew that I wanted to go home with a smile. I didn’t want to disappoint myself at the end of the day. And I know my mentality. I’m a fighter. I knew that I had to do it for myself, for my coach,” she said. She also came from behind to make podium, taking the eighth spot down the stretch with a time of 2:18.56. Beavercreek sophomore Ben Ewert posted a time of 4:27.94 in the D-I 1,600, missing the podium. Ewert suffered an injury earlier the season but was able to recover and make it to state. His teammate, senior Tristan Tapia also missed the podium in the D-I 800. Cedarville senior Tim Stevenson finished in ninth place in the D-III 400. After suffering a hamstring injury on Friday’s 400 qualifier, Stevenson wasn’t sure how he was going to perform in the final. He missed the podium, posting a time of 52.20. Greenon senior Dan Wallace missed the podium in boys discuss.